This child and her family were photographed in Central Park, Huntington Beach, adjacent to the Huntington beach Central Library. During the last drought. The duck pond was dry allowing for photography in places otherwise not possible during the wetter years. This photo was taken in the dry duck pond amidst the reeds and blooming plants near sunset. The little girl was very quiet and reserved. So I thought it best to give her some time to habituate to my presence and keep some distance between us while photographing her with a long lens. The long lens allows the viewer to get have the perspective of an outsider looking into a child's world. Her mother was able to get her attention between picking flowers and playing with butterflies just long enough to create this photograph. 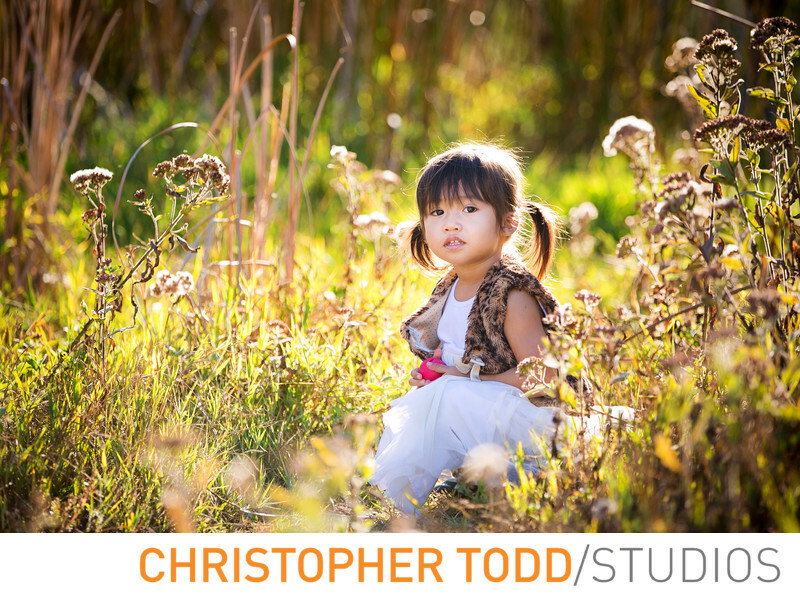 The late afternoon lighting works best when behind the subject so they are not squinting their eyes into the sun and wrapping light around the little girl thereby separating her from the background of reeds and foliage behind her. When creating photographs of kids or families, one must not forget to connect with the group especially children at the beginning of the session in order to get the most cooperation possible. Location: 7111 Talbert Avenue Huntington Beach, CA 92648. 1/200; f/3.5; ISO 100; 165.0 mm.